FCC boosts power limit for outdoor unlicensed 60 GHz links « Steven J. Crowley, P.E. The FCC has adopted a Report and Order that raises the power limit for outdoor links operating in the 57-64 GHz band on an unlicensed basis. The average equivalent isotropically radiated power (EIRP) limit is raised from 40 dBm (10 watts) to a maximum of 82 dBm (158,489 watts) depending on how high the antenna gain is. The peak power limit is 3 dB higher. The new power limit is comparable to others the FCC has in the fixed microwave services.This increase is expected to enable higher-capacity outdoor links extending to about one mile. Connection of buildings on a campus is one application, as is connections of small cells within a 4G macrocell. In addition to higher power limits, the FCC also changed the way 60 GHz emissions are specified for consistency with other rules, and it eliminated the need for certain 60 GHz devices to transmit an identifier. There’s no change to indoor power limits, such as for 60 GHz devices based on the WiGig (IEEE 802.11ad) or WirelessHD (IEEE 802.15.3c) specifications. IEEE 802 filed comments requesting tighter restrictions than those adopted by the FCC, to reduce the chances of outdoor-to-indoor interference. The FCC pushed back and struck a reasonable balance. The new rules are nine years in the making. The trade association Wireless Communications Association International filed a Petition for Rulemaking in 2004. The FCC granted that request with a Notice of Proposed Rulemaking in 2007. Comments were received, and then not much happened until except for repeated urgings from Bridgewave Communications, the lead proponent, to get moving, especially in the face of the emerging small-cell application. It’s not clear in the record how well a given link will perform, in part due to the unusual propagation characteristics of 60 GHz, discussed below. 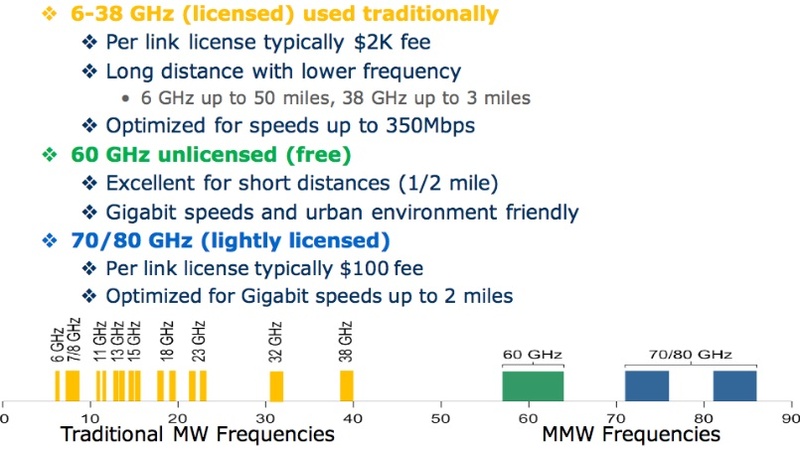 In 2010 Bridgewave suggested the small-cell alpplication “using smaller 60 GHz radios to provide a 500 meter link with 100-500 Mbps capacity (and eventually 1 Gbps).” The FCC’s press release is more optimistic, saying the new limits “could provide wireless broadband network connectivity over distances up to a mile at data rates of 7 Gb/s.” There’s “up to,” and there’s practical. The Bridgewave web site shows current 60 GHz equipment with data rates of 1000 Gbps, and with ranges up to 1.5 miles, but there’s no indication of the reliability of getting both at once. Regardless, the higher power limit will allow higher data rates over longer distances. Bridgewave suggests another important benefit of higher power: being able to use lower-gain, smaller, and thus less visually obtrusive antennas, which increases options for placement. As the number of small cells increases, best the backhaul hardware be small, too. 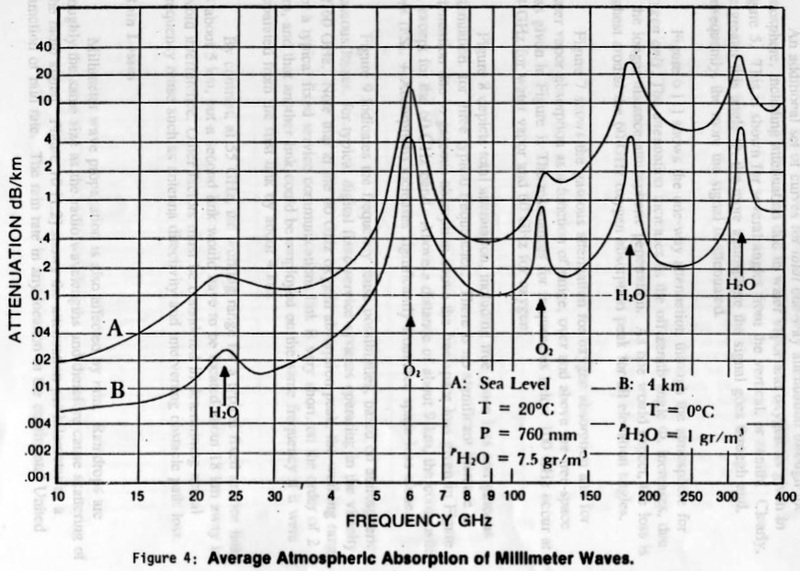 Figure 4 from the bulletin depicts atmospheric absorption of radio waves across a range of frequencies for two scenarios: sea level at moderate temperature and higher humidity, and at 4-kilometers elevation at freezing temperature and lower humidity. Attenuation is worse at sea level, about 15 dB per kilometer, or a factor of 32. (This is on top of other path losses.) Note that one doesn’t have to move far from 60 GHz to get much less attenuation. The bulletin discusses attenuation from rain, and provides some maps and curves that can be used to estimate it. The higher the rain rate, the greater the margin that must be designed into the link to maintain a given reliability. Other sources of additional loss or reduced reliability are foliage (avoid it) and noise from a variety of sources. With all these propagation impediments, why bother? 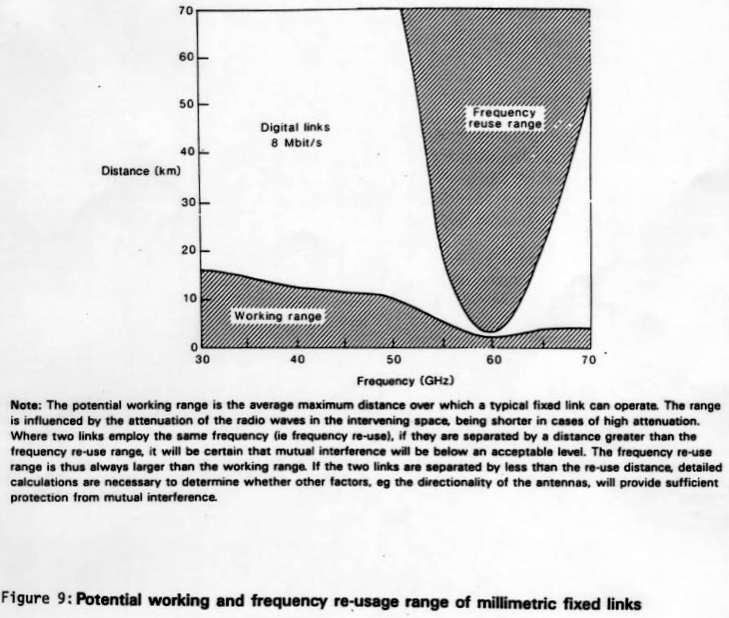 One reason is that the severe attenuation means links on the same frequency can be reused much more closely than they can on other frequencies. The bulletin’s Figure 9 has a nice depiction of this. For the assumptions used, the range of the link is about 2 kilometers, but the reuse distance is about 4 kilometers. The ratio of reuse distance to link distance is lowest at 60 GHz. Though the new rules were adopted by the FCC, they don’t take effect until 30 days after the date of their publication in the Federal Register. This entry was posted on Sunday, August 11th, 2013 at 2:53 pm and is filed under 60 GHz, Millimeter-wave, WIGig, WIrelessHD. You can follow any responses to this entry through the RSS 2.0 feed. You can leave a response, or trackback from your own site.